In celebration of Volunteers’ Week (1st to 7th June), Zeinab Makki interviews one of EducAid’s most frequent volunteers, retired biology teacher, Ken Hall. For seven years, biology teacher, Ken Hall has been volunteering at EducAid. Twice a year he travels to Sierra Leone to help in the development and education of young, vulnerable Sierra Leoneans. His visits span between six to eight weeks. The experience at EducAid is simply “amazing and inspiring,” Hall insists. For him and many other staff and volunteers at the Lumley, Freetown school a typical day starts with an 8 am morning briefing where staff discuss the plans of the day followed by “family time” discussions with tutor groups. After that at around 10 am, Hall’s biology lessons begin. “I try to arrange lessons with groups that have examinations coming up and in which we try to do revision or extend their knowledge.” Volunteers tend to be passionate and devoted to the growth of their students as Hall exemplifies with his afternoon hours dedicated to helping students complete extra work. The education system caters to various levels. From teenagers completing their final year with hopes of moving on to university, to adults learning to read and solve basic maths. Whilst the official school day is over by 3.30 pm the work doesn’t end there he explains: “In the evenings, really whatever comes along in terms of help. If people want some help in one respect or another: listening to people read English to doing biology. That’s how it is”. Volunteers like Hall are given the opportunity to work with day students and boarders. Staff are present throughout the days and evenings to provide any aid or support. Hall encourages potential volunteers to explore the opportunity. He says that despite the “culture shock” the experience is “very, very rewarding”. 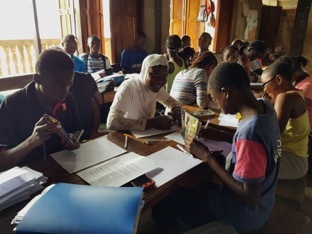 A free school catered towards developing and supporting students from impoverished backgrounds is not so common in Sierra Leone, and unnecessary in the West.